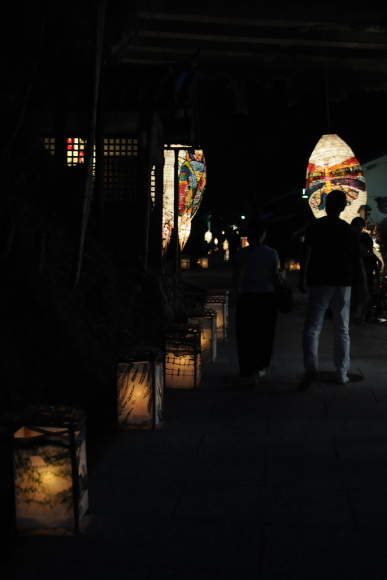 In August, when the Japanese celebrate Obon – the festival of the dead – there are many related events, and not all of them take place during the few days leading up to August 16th, when the dead are sent back to the underworld again. The Sento Kuyo or Manto Kuyo festivals take place at temples throughout Japan, and they are meant as memorial services for ancestors long gone. Tonight, there was the Sento Kuyo (literally: 1000 lights memorial service) festival at Adashino Nenbutsu-ji Temple. This temple from the Heian period, located in the Arashiyama mountains west of Kyoto, is famous for its approximately 8000 stone monuments. Many of them are quite small and have been found during excavations in the area – which has long been a graveyard – in the early 20th century and relocated to the temple grounds. Some of them are in the shape of small Japanese tomb stones, others may have once been Jizo statues; it’s hard to say because they are heavily worn with age. 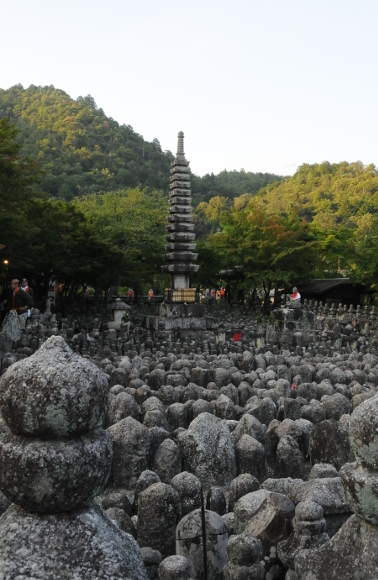 Whatever their former purpose, they now stand densely packed in a walled part of the temple grounds, with a large stone pagoda and Buddha at the center. And this garden of stones lies at the centre of the Sento Kuyo ceremony. In the beginning, the monks chant sutras in a small building adjacent to the cemetery. Then, the first candles are lit before the central Buddha in the cemetery and the monks pray there, before making a round through the cemetery. Temple staff will now light the first candles and distribute them throughout the graveyard, there are little iron spikes everywhere, on which the candles are placed. When the first candles have been lit, visitors to the temple are now invited to also light a candle at one of the stones. I have seen many people doing this and saying a little prayer there, even though it is not known whom the stone belonged to – or if it was ever meant as a tomb to begin with. The ceremony starts at 18:00 and there is chanting all the way through until the temple closes again at 20:30. It is very nice to watch as dusk is falling and the candles are (almost) the only thing lighting up the graveyard in the end. 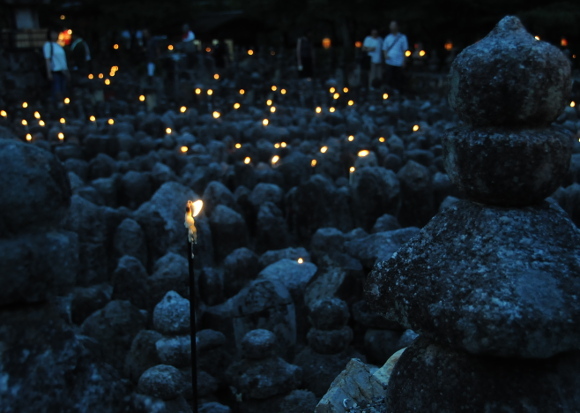 I think it was a beautiful and spiritual sight, but the Japanese friends I talked to say to them it’s just creepy. Maybe that was part of the reason why the ceremony attracted relatively few people. At least it did not feel crowded at all, even though the part where the ceremony took place is relatively small. After I had decided to have taken enough photos, I left, and downstairs, on the street passing the temple, there was another, more profane light up: Large hand painted lanterns lined the street on both sides, and here and there, huge oval lanterns were hung up and served as a focal point. Many of the lanterns were painted by kids, but there were a few really artistic ones as well. The backdrop there were old houses; apparently this is part of a special preservation area at Arashiyama. In any case, I had a nice evening watching the ceremony. It was touching to see people coming and praying over their candle that they had just placed somewhere… I really should go there again at some point and have a closer look at Adashino Nenbutsu-ji and its surroundings – during daylight hours.